The discovery of historic ammunition at the new St James Centre site has sparked a major emergency response in Edinburgh. -The area has now been reopened. -Emergency services, including police, fire and ambulance service and bomb disposal squad are in attendance at the new St James Centre building site. -The incident was reported to police at around 1.40pm on Tuesday, 15 January. -A police cordon is in place at Elder Street and Multrees Walk to ensure the safety of the public. 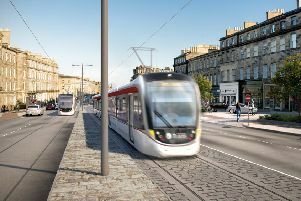 -There is currently no pedestrian access to Edinburgh Bus Station via Queen Street but the station remains open to passengers and vehicles. -It is believed workers will not get back on site today while police deal with the incident. We’ll bring you the latest updates on this developing story as we get it. In the meantime, follow our LIVE blog here.